This is essentially a fruit puree that you dry out very slowly over a number of hours in a low oven. It’s preserving at its most straight forward. 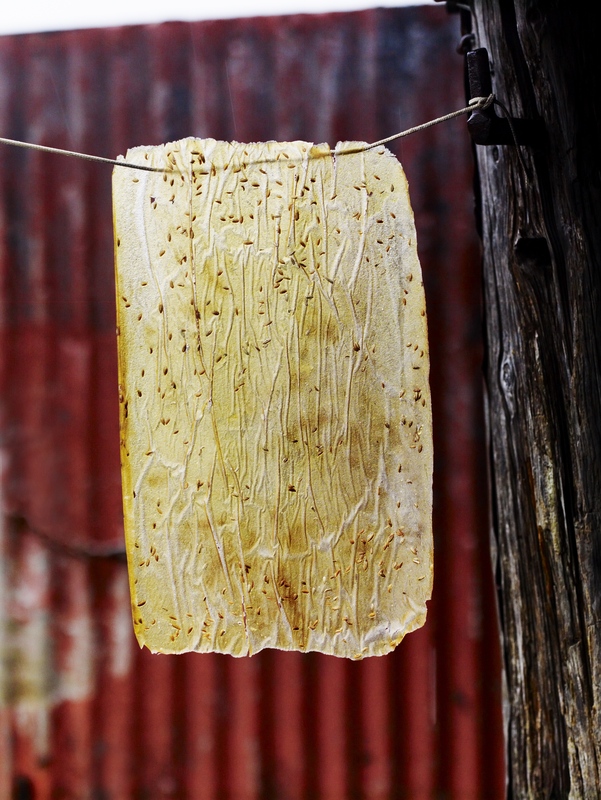 Once made you can store this fruit leather wrapped up in an airtight container for months. It makes a delicious snack on the go, it’s great in packed lunches or served with a selection of cheeses after supper. The fennel seed gives it a really unusual flavour. It work s o well with the apples. Place the cider apples in a wide heavy based pan with a splash of water and set over a gentle heat. Cook them, stirring regularly, until they are tender and pulpy. Remove the pan from the heat and push the pulp through a moulis with a fine gauge. If you don’t have a moulis, you can rub the mixture through a sieve. Add a good tablespoon of honey and stir well to combine. Taste for sweetness, adding more honey if you need to, but remember it doesn’t need to be over sweet. Divide the mixture between two non-stick parchment lined baking sheets, smoothing it out as evenly and as thinly as you can. Pre-heat the oven to a low setting, 60.c is good. Place the trays in the oven and dry them out in the low heat. It will take about 12 – 14 hours at this temperature; it should be completely dry, even at the centre. Once cool, peel the leather off the parchment and lay it onto a new piece. Roll up the leather and parchment and store in an airtight container for up to 4 - 5 months.